lake cabin Archives | Excelsior Homes West, Inc. It seems like winter doesn’t want to end here in Minnesota, but we’re looking ahead to the warmer days of summer when we get to enjoy time at the lake. Are you thinking about building or upgrading your lake home or cabin? 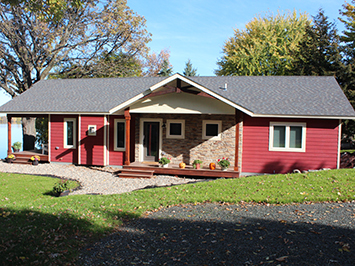 Modular and manufactured homes make great lake home and cabin solutions. The variety of options, affordable pricing options and timely build/setup make modular and manufactured homes a desirable lake property housing solution. If you are looking for a cabin that can be put in place yet this year, with time left to enjoy on the lake this summer, a modular or manufactured home may be the home you’ve been looking for. Many of the modular and manufactured homes have portions that you can customize to make it match your style and needs. Are you envisioning a cape cod, loft, rambler or two story home or cabin? There are options. Would you like a porch and fireplace? We can make it happen. How big is your lot? This impacts the size of home you can select. What style home are interested in building? Is this a year-round or seasonal property? What is your budget for the home? Think about these things before you start looking at options and your lake home search will go smoothly. Enjoy your lake life this year! While many of the homes we offer can be placed on lake property there are some designed with lake life in mind. View our selection of lake homes and cabins! Over the years we have sold many lake cabins. Often times lake homes are seasonal cabins and not occupied year round, making it a great target for trespassers. With summer in full swing, we have come up with some ideas to maximize lake cabin protection from theft and/or vandalism while you are away. Take pictures and video of your property and belongings inside and outside of your home. Make an itemized list of your valuables. This can be very helpful for insurance purposes if you ever have an issue. Lock all doors and windows. If you do not have deadbolts you may want to consider purchasing. Don’t forget to lock storage sheds/buildings and remember to place a piece of wood in patio door tracks. Install interior lights with timers that automatically go on and off periodically. This gives the appearance that someone is occupying the home. Install an exterior motion light. Consider installing a security system. There are many options with sound and video options. Some systems you can even monitor from your smart phone. Heartland Security and ADT are a few Minnesota Security System Companies to choose from. Place security stickers and signs on your property to detract unwanted guests. Avoid leaving valuable items in plain sight. Put gear away when not in use. Invite your neighbors to report any suspicious activity at your Lake cabin, especially when you are not there. Creating a neighborhood contact list is a great way to stay in touch with your neighbors who are a great resource for helping protect your lake cabin. Think about your lake cabin protection today by using some of the tips we provided. We hope you enjoy your summer lake cabin and can relax knowing it is safe and secure.